Welcome to the NVSC Referee Website!!! Thank you for visiting the NVSC Referee Website. Here you will find most of the information needed to help make your referee season a HUGE success. There is a lot of information on this page and the links to the right, so ensure you scroll down and visit our other pages so you don't miss anything. We use Arbiter to assign and manage games for the club, so if you are a new referee or new to our club you will need an account. Our contact and information form can be accessed using the Arbiter Access (referee link above). Once you've completed the form, send me an email to let me know. The links within our referee section also contain important information about our club policies, operating procedures, modifications to the laws of the game for the various leagues, field locations and layouts in the park as well as referee tools and education. Referee Game Cards - This is a great way to record your game details. There are 2 versions (your preference), print and take with you to the field. Record information during the game (scores, cards shown, issues with coaches, etc...) so you have a record to use when submitting your report in Arbiter. Each version prints as 3 cards per page. We have added important information about Concussions in Soccer. This information has been compiled from the work of US Youth Soccer and the CDC. The Field Guide has summaries of the modifications to the Laws of the Game for the youth leagues U7 through U19. Print a copy of the guide to have as a handy reference at the field. It is designed to be either stapled into a booklet or hole punched and placed in the 5x8 three-ring binder. As the guide is updated, there will be a new version date at the bottom of the page. 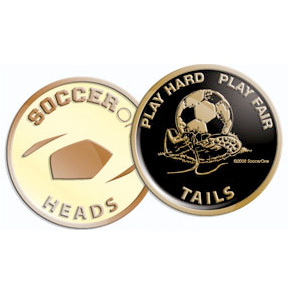 Though the field guide is a useful quick reference, each referee should familiarize themselves with the clubs full policies and procedures as well as the modifications to the Laws of the Game contained here and those for the various leagues for which you may be assigned SFL , ODSL, CCL and VAPL - to ensure you know the differences. Links are available to these sites and other documents. Now that you are a US Soccer Certified Referee, it is always good to stay up to date on the current Law Changes, and US Soccer Referee Directives. The best place to get this information is the US Soccer Website at www.ussoccer.com. Not only does it provide referees with helpful information about officiating matches, but it can help keep you up-to-date on the events surrounding the US Men’s and Women’s Soccer Teams. U.S. Soccer Federation Referee Program - U.S. Soccer is committed to producing a variety of referee education resources aimed at supporting the program's approximate 140,000 members across the country that service amateur games at the youth and adult levels. http://www.ussoccer.com/referees/overview. Laws of the Game - Many helpful documents including the Laws of the Game, Yearly Memorandums, Law Updates, etc...: http://www.ussoccer.com/referees/laws-of-the-game. See you on the pitch!!!! 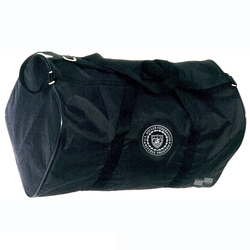 What is required for a Complete Referee Uniform? Black USSF Referee Jersey - Alternate Color. May be required as you gain experience and officiate more competitive matches to ensure you have a different color than the teams playing. Red USSF Referee Jersey - Alternate Color. May be required as you gain experience and officiate more competitive matches to ensure you have a different color than the teams playing. Blue USSF Referee Jersey - Alternate Color. May be required as you gain experience and officiate more competitive matches to ensure you have a different color than the teams playing. 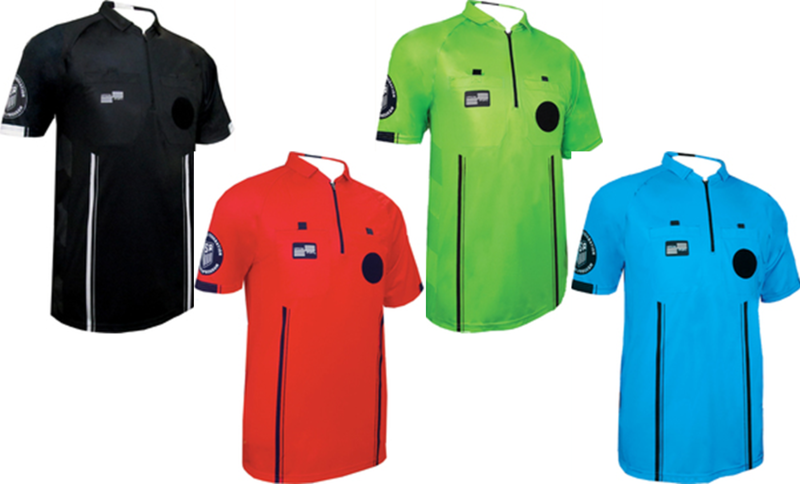 Green USSF Referee Jersey - Alternate Color . May be required as you gain experience and officiate more competitive matches to ensure you have a different color than the teams playing. Starting in 2019 officials should be wearing the new style uniform jersey - Standards of Dress. The biggest change to previous uniforms are shirt and socks. If you own the old 3 strip socks or old pinstripe and broad stripe shirt, they are no longer part of the official uniform and should not be worn. These seem to be common questions for new referees "What color shirt do I need? Do I need black shorts?" 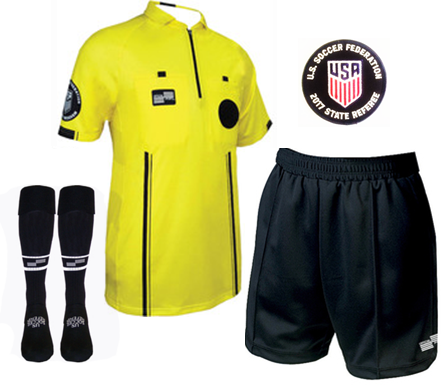 - for all referees the basic uniform should be a short-sleeve yellow USSF jersey, black referee shorts (these are not player shorts – no stripes or piping), the two stripe USSF referee socks, black or mostly black shoes, and the badge of the current year. This will cover most games. As you develop and accept more challenging games, you may need other colors. I have found that in our area, black is a good alternate then red when you need a third. 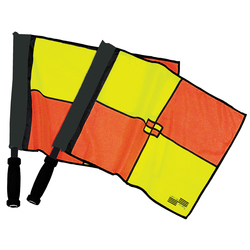 There are several resources online where you can find referee equipment. Ensure you’re getting the current authorized version as several sites still have the old styles listed. Basic pay scale applies to both House and Surburban Friendship League Games.